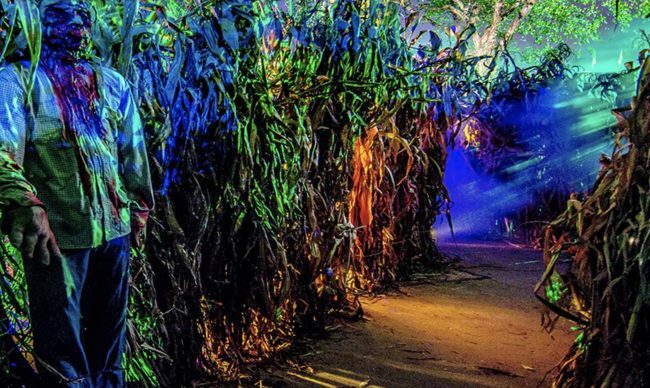 Scarowinds Haunt is the Carolinas premier Halloween event for the whole family, except the night part… I’d leave the kids at home if you plan to stay after the sun goes down. Once the lights are out, the monsters start to fill the midways to terrorize anyone who may cross their path. Similar to Halloween Horror Nights, Scarowinds has a series of Haunt mazes, and Haunt fright zones. 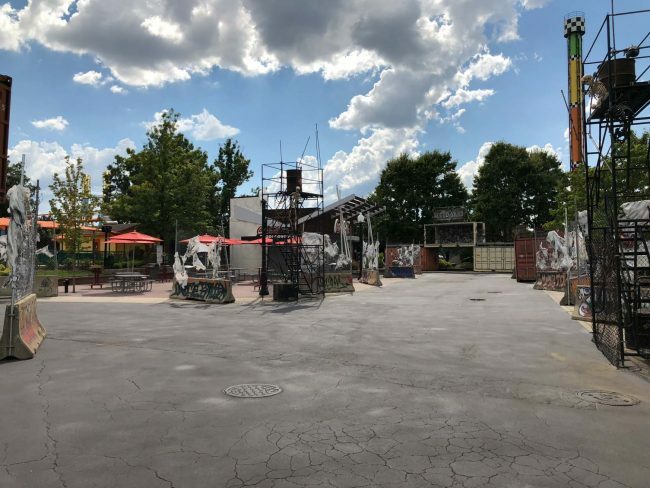 Make sure to not miss the two new additions for Scarowinds 2018, Deadman’s Landing, and the Hollow. Here is a first look at the newly updated Blood Yard Scare Zone. This area has a very concrete and city feel, with large two story stacked shipping containers. Wrecked cars, and plenty of places for some ghouls to lurk.. There will be more coming after the event officially kicks off this Friday, ( Storm permitting ) such as POVS, food review, and exclusive Theme Park HD interviews with guests at Scarowinds. *Please note: All ticket prices listed are the lowest price listed, prices change based on certain dates. All prices listed are if tickets are purchased online only. Tickets are more at the gate. Scarowinds Unlimited Pass: Valid for Unlimited Visits to Scarowinds only. No regular daily admission. Scarowinds 1 Day Admission + Fright Lane Combo: Starting: A one day ticket for the event, a fright lane pass. Parking is not included. Scarowinds All Inclusive: A one day ticket for the event, free parking, one fright lane pass, and one meal plan voucher valid that day only. Scarowinds Bring a Friend Ticket: If you are already a Carowinds season pass member, you get in to the event free, so bring a friend with these low priced tickets. Fright Lane: Fast pass system for the events haunted mazes. This is for mazes only, and operate from Fast Lane. Think you have what it takes to brave the creatures of Scarowinds? If so head over to Scarowinds.com to get your 2018 event ticket!